This sponge bores into large stony corals. 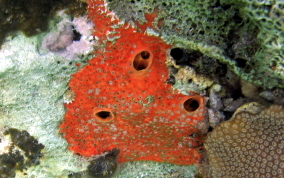 As the sponge grows it excavates the inside of the coral colony body. 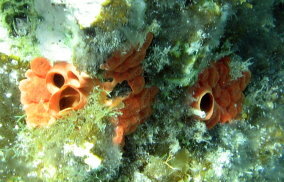 Some specimens look like encrusting with large areas of the sponge body exposed, while other instances only a few of the siphons are expose. They are easy to spot because of their bright red or red orange color at depths of 5 or more feet.